The Lakeshore Path is the ribbon that ties the entire Lakeshore Nature Preserve together—the path either runs through or near all the major areas in the Preserve. There are actually two trail segments that make up the Lakeshore Path: the Howard Temin Path and the Lake Mendota Path. The Howard Temin Path (in yellow) extends from North Park Street (east) to Oxford Road (west). The Howard Temin Path was given this name in 1998 as a tribute to the late UW-Madison professor of oncology and Nobel Prize winner. Howard Temin often walked and bicycled along the path, finding opportunities for quiet reflection and contemplation along the shoreline. 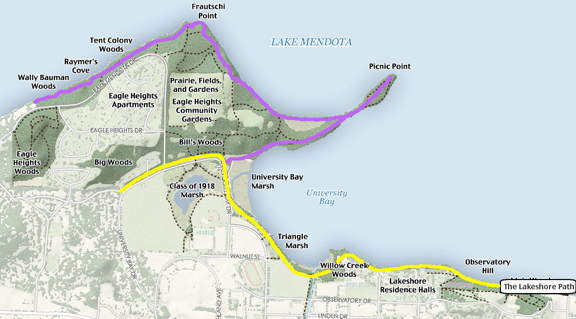 The Lake Mendota Path (in purple) intersects with the Temin Path at the main entrance to Picnic Point where it extends to the tip of Picnic Point then follows the shoreline to Wally Bauman Woods. Please note: bicycling is permitted on the Howard Temin Path but it is not permitted on the Lake Mendota Path. We invite you to take a stroll or ride along the Lakeshore Path to enjoy the many opportunities it offers for viewing the lake, glimpsing the wild creatures who live along its margins, meditating on the beauty of nature, and sharing the company of friends. The Lakeshore Path developed over many years—indeed, thousands of years. There can be little doubt that the earliest people to arrive in this area, about 12,000 years ago, created footpaths along the shore to gain access to the water or move between their habitations and ceremonial sites. When we travel along the lakeshore today, we are literally following in the footsteps of those who came before. The ancient Native American presence in the Four Lakes region is explored in greater detail on the Native Americans and the Preserve page. The first European-American settlers in this area no doubt followed many of the same well-established Indian routes around the lake. It should be noted, however, that with the construction in 1849 of a dam at Lake Mendota’s outlet into the Yahara River (near the site of today’s Tenney Park Lock), water levels rose at least 4 feet. Subsequent dam expansion raised the water level even higher. In places, this meant that formerly dry ground was flooded and is now under water. Some of the original Indian footpaths thus now lie beneath the waters of the lake. The first segment of the Lakeshore Path constructed (or improved) was developed on the 198-acre parcel of land purchased by the university in 1866 west of the original campus on Bascom Hill. This tract was acquired to create an Experimental Farm, which came to support a variety of agricultural enterprises such as orchards, livestock pastures, and research fields. Also visit the Observatory Hill page. A little-known consequence of early development of the farm (Fig. 1) was the construction of a network of farm roads and pleasure drives in the late 1860s. …one and three fourths miles of avenues have been constructed, three fourths of a mile extending along the shore of Lake Mendota. These avenues afford pleasant drives, and add greatly to the attraction of the grounds by giving an opportunity to visit in carriages localities from which may be seen some of the most beautiful landscape views in this vicinity…. The use of the Experimental Farm’s shoreline road for recreational carriage drives was quite popular with the residents of Madison. With the rapid expansion of the city and the university populations, interest grew in linking the university road to the already constructed pleasure drive near Eagle Heights. In 1892, a small group of energetic Madison leaders pooled their resources and built a westward extension to the Experimental Farm drives, crossing over what was then private land adjacent to University Bay. This new route required the construction of a bridge to span Willow Creek, then known as University Creek (Fig. 2). 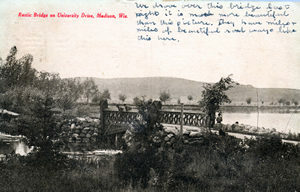 Within two years of completing the new so-called Bay Road and rustic bridge, the group founded a new organization: the Madison Park and Pleasure Drive Association (MPPDA). The new Bay Road was constructed on a sand bar ridge that separated University Bay from the marshy area to the west. Long rows of trees were planted along the sides of the 33-foot wide road. The tree planting was carefully overseen by John M. Olin, a law professor at the university and for many years the president of the Madison Park and Pleasure Drive Association. Olin sought trees that would stabilize the highly erodible shoreline, produce shade quickly, and be able to tolerate wet soil conditions. Willow trees, primarily the crack and golden species, were selected to meet these conditions and were purchased from nurseries across the Midwest. For a time, Olin used his property (now part of the Preserve’s Big Woods) as a plant nursery for his MPPDA landscaping projects. 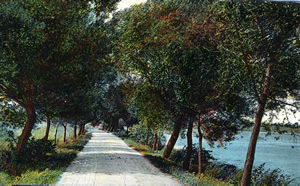 The first willows along the Bay Road were planted in 1900, and by 1910 a full canopy is evident in historic photographs. Willows are not particularly long-lived trees, due in part to their habit of rapid growth. By the 1970s, most of the original trees planted in the early 1900s were in decline and posed a possible safety hazard from falling limbs. Many of the willows were removed and replaced at this time. Additional willows were removed in 2004 in the course of a major restoration of the Howard Temin Lakeshore Path. This time, instead of exclusively planting non-native willows, landscape planners selected a combination of swamp white oaks and river birch (both native species) to mix with the replacement golden willows. As the remaining older willows along this part of the Lakeshore Path decline, new willows will be planted in combination with native trees to maintain this landscape heritage. 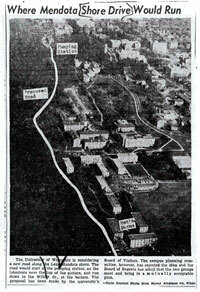 The construction of the Tripp and Adams Men’s Residence Halls in 1925 and the Kronshage units a decade later led to much heavier student use of the path along the lake connecting the lakeshore dormitory area to the lower campus. The opening of Elizabeth Waters Hall on the north slope of Observatory Hill in 1940 increased still further student use of the lake path. The portion of the lake path between the present-day Charter Street extension and the Union was particularly challenging. This narrow and unimproved trail segment was slippery and muddy much of the time during inclement weather (Fig.4). This hand-colored greeting card postmarked 1916 carried the cryptic inscription “Wooded area, near university buildings.” From similar-looking postcards from this era, we now know that this is a picture of the shoreline path at the base of today’s Muir Woods. 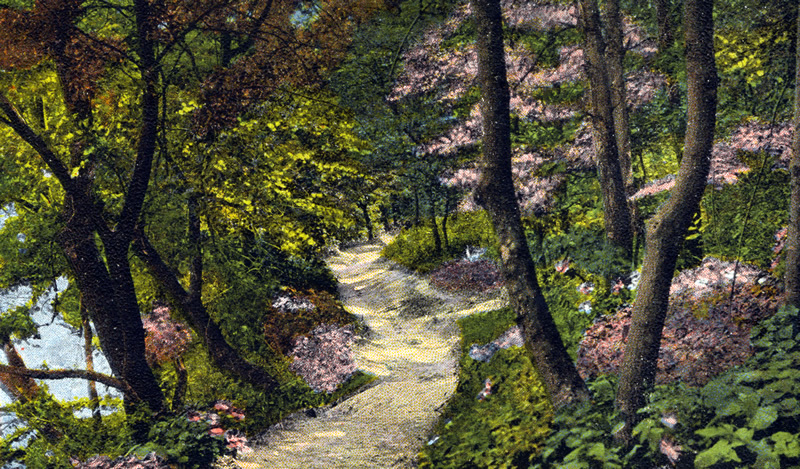 Some historical references called this lovely spot “Lover’s Lane.” (Source: CLP-W0023). In the spring of 1941, a committee of the Student Board, the campus student government, decided to improve the lake path. Under the leadership of Robert Avery, Class of 1941, the group promoted an all-campus student work day to widen and resurface the lake path between the men’s dorms and the Union, using cinders from the University heating plant. Calling themselves the campus WPA – We Pave Anything – they collected graders, steam rollers, a large supply of shovels and rakes borrowed from the real WPA office, and 1700 cubic yards of UW cinders for the undertaking. By the scheduled date on Saturday, May 17, 1941, the project had become a competition between the Greeks of Langdon Street and the residents of the lakeshore dorms. That morning both groups marched behind two brass bands to the eastern terminus of the lake path at the Hydraulic Lab, where President Clarence Dykstra threw the first shovel of cinders (Fig. 5). Engineering students employed their surveying skills and others used the borrowed heavy equipment to widen and grade the path. Students, numbering 1,200 men and women (Fig. 6), then worked so industriously with shovels and rakes that they ran out of cinders late in the day. This first student work day ended appropriately with a celebratory street dance at the Memorial Union and refreshments contributed by Madison’s Fauerbach Brewery. 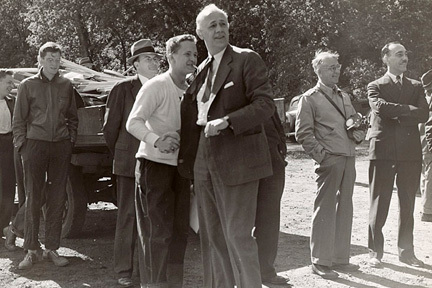 President Dykstra shaking hands with Robert Avery, class of 1941 and organizer of the first campus Work Day, before beginning work on resurfacing the lakeshore path. Source: “President Dykstra during Work Day,” May 14, 1941 (archival photo date May 17, 1941), University of Wisconsin archive images, UW Digital Collections, UW.UWArchives.dn06072605.bib. 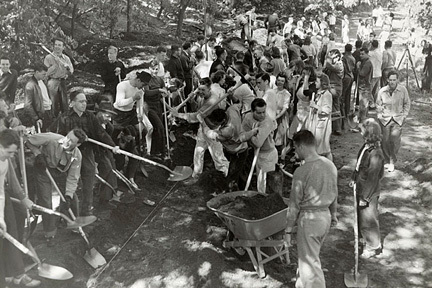 Over 1200 students spread more than seventeen hundred cubic yards of cinders to resurface the lakeshore path during the first campus-wide Work Day, on Saturday, May 14, 1941. Source: “Resurfacing of the lakeshore path during Work Day,” May 14, 1941 (archival photo date May 17, 1941), University of Wisconsin archive images, UW Digital Collections, UW.UWArchives.dn06072606.bib. With the growing popularity of automobiles in the early part of the twentieth century, conflicts with horse-drawn carriages along Willow Walk were inevitable. Speed limits and restrictions on times and days of use only partially alleviated the tension between carriages and cars. Between 1928 and 1931, an additional lane was added to the Willow Walk, running parallel to the original route between Picnic Point and Willow Creek. It appears that at this time the name “Willow Drive” came into use, replacing earlier names. Traffic volume continued to increase along the Willow Drive as the number of cars on the west end of campus rose. In response, proposals were made to add another new lane to the drive. Other people advocated extending Willow Drive all the way to the Memorial Union-from Elm Drive to North Park Street. News clipping “Where Mendota Shore Drive Would Run,” Wisconsin State Journal, April 28, 1957. In 1957, a controversial recommendation was made to build a new “Shore Drive” that would have necessitated filling parts of the lake near the Lakeshore Residence Halls. A 350-space parking lot was also contemplated at this time-to be constructed on new land created by filling in Lake Mendota near the present-day Hasler Limnology Lab. Fortunately both proposals were rejected. Just imagine how different the Lakeshore Path would be today if these concepts hadn’t been soundly defeated! Despite the defeat of the Shore Drive and lake parking lot proposals, Willow Drive was expanded. In 1958, a decision was made to create a third lane—just to the west of the earlier roads. The new road (third lane) between Lake Mendota Drive and Walnut Street allowed planners to close the original lakeside lane to all but pedestrian, bicycle, and boat launching traffic. As an additional measure to control traffic, the portion of Willow Drive between Walnut Drive and Elm Drive was restricted to one-way auto traffic, moving from east to west. Over the next 30 years, conflicts between pedestrians, bicyclists, and automobiles were not uncommon on sections of Willow Drive where a hodge-podge of lane restrictions applied. Bicycles and cars often were uncertain about (or ignored) the rules of the road. The confusion over road rights came into clear focus with a tragic accident in 1991. Along a segment of shoreline road near the beach at The Willows (also called Willow Beach), a cyclist was killed—due in part to the confusing confluence of cars, bicycles, and pedestrians all operating on a narrow road. Two bicyclists, traveling in opposite directions, collided head-on as they tried to pass each other in the narrow space allocated to bike riders. One of the bicyclists (the one not wearing a helmet) died from injuries sustained during the fall. Soon after, all non-official car travel was prohibited on these shoreline roads. The most recent major modification of the Lakeshore Path occurred in 2004 as part of a $411,000 project on the west end of the Howard Temin Lakeshore Path segment between Oxford Road and the Willow Creek Bridge. and resurfacing and raising portions of the path to prevent floodwaters from reaching University Bay Drive. As a consequence of the regrading, hazardous willow trees were cut down and replaced with 51 new trees. Today the Lakeshore Path is used by hundreds of visitors each day: as a source of recreation, as part of a daily commute to work or class, or as a daily ritual to clear the mind and reflect on more important things in the midst of a busy day. We hope your visit will be safe and enjoyable. To see a map of the historic location of the pleasure drives on the lakeshore, go to the interactive map and click the Human Landscapes button, then turn on the “Madison Park and Pleasure Drive Association” layer. One of the great appeals of traveling along the Lakeshore Path is the opportunity to view Lake Mendota. Unfortunately, over the past few decades invasive woody shrubs, such as buckthorn and honeysuckle, have grown up along the shoreline, making it almost impossible to see the lake in many parts of the path. While some people might assume that these dense thickets of shrubs are helping to stabilize erodible banks, this is rarely the case. More often, the invasive shrubs are growing so densely that they are shading out all the plants that might otherwise cover the ground. These ground-layer plants are critically important for holding soil on steep banks and keeping wave-action or stormwater run-off from eroding the shore banks. Invasive shrubs not only degrade the ability of visitors to enjoy some of the most beautiful aspects of the Lakeshore Path, but threaten the shoreline as well. If you look beneath a buckthorn or honeysuckle shrub, what you will notice is bare ground—so effective are these plants at preventing any competition at their feet. Opening up views by selective removal of undesirable woody shrubs has already begun. 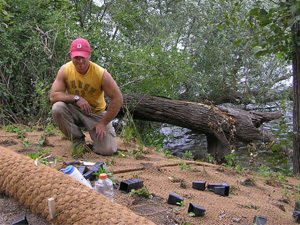 Invasive shrub removal is followed with restoration activities to stabilize erodible banks, re-establish fertile soils, and re-introduce site-appropriate native plants. This vital view-opening and restoration work began early in the spring of 2006 and will continue for an indefinite period. Perhaps you have noticed some of the re-established views from the path near the Lakeshore Residence Halls. This important restoration work is being funded by generous gifts provided by the Class of 1953 and the Academic Fund. 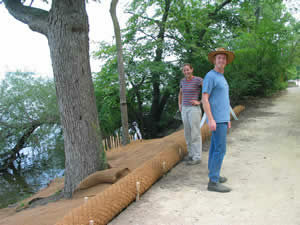 Student workers install erosion control fabric to stabilize bank prior to replanting, August 2006. Photos by Daniel Einstein. 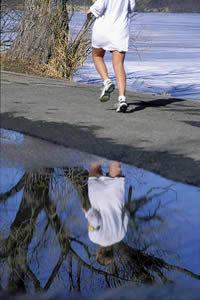 Runner on Howard Temin Lakeshore Path. Photo by Jeff Miller/UW-Madison. The Lakeshore Path provides a wide array of recreational opportunities. All types of visitors can enjoy the Lakeshore Path: cyclists, walkers, joggers, parents pushing strollers, rollerbladers, or even cross-country skiers. Travel at speeds that are safe for you and the other people with whom you share the path. On sections where the path is undivided, please stay to the right and allow others the option of passing. Where available, use the segregated pedestrian and bicycle lanes as appropriate. Please remember that bicycles are ONLY permitted on the Howard Temin Path segment (North Park Street to Oxford Road) and the paved path that passes through the woods from the Howard Temin Lakeshore Path to the intersection of Lake Mendota Drive and Eagle Heights Drive. Bicycles may not be ridden on any other trails and roads in the Preserve. Dogs are permitted in the Preserve, but they must be on leash at all times. Please pick up after your pet. University service vehicles must occasionally travel on the Lakeshore Path to do maintenance work. Private vehicles are prohibited from driving on the path at all times. East (Howard Temin segment): Trailhead at the north end of North Park Street, near the Memorial Union. West (Howard Temin segment): Trailhead at the intersection of University Bay Drive and Oxford Road. Picnic Point (Lake Mendota Path segment): Trailhead at the opening in the stone wall, off University Bay Drive. Raymer’s Cove (Lake Mendota Path segment): Trailhead off Lake Mendota Drive. Wally Bauman Woods (Lake Mendota Path segment): Trailhead near the intersection of Eagle Heights Drive and Lake Mendota Drive. The unpublished manuscript, A Niche in Time, co-authored by Richard McCabe and Stefanie Carpenter (now S. Brouwer), as well as other material produced by the University Bay Project, provided valuable references and insights used in the preparation of this article. These materials are available for review at the university archives at Steenbock Memorial Library.